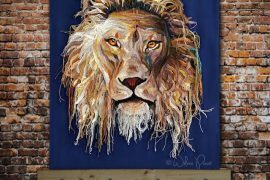 I want to go outside of the box for this week’s profile of an artist who works with crochet. Margaret and Christine Wertheim are the minds behind the Institute for Figuring’s Hyperbolic Crochet Coral Reef project, an eco-friendly math-smart crochet project that has inspired many crafters around the world. The project was originally intended to communicate about science and technology but was more broadly accepted by the art world than the science world. The intention of the Wertheim’s work goes beyond just consumption as art but it definitely emphasizes beauty and has strong links to the art world. The reef project specifically is a great art project and one that I don’t want to neglect to highlight in this blog. Margaret Wertheim is a cultural historian and science author who formed the Institute for Figuring (IFF) in 2003. Her twin sister Christine Wertheim is a cultural studies professor at the California Institute of the Arts. Together they launched and curate the Hyperbolic Crochet Coral Reef project, which has been exhibited in both art galleries and science museums around the world, starting with the Andy Warhol Museum in Pittsburgh in 2007. This project helped them to receive the first ever Theo Westenberg Grant for Women of Excellence from The Autry Museum. The sisters are originally from Queensland, Australia but now live in Los Angeles. They learned to crochet from their mother. The IFF is an organization that works to educate the public about the aesthetic and poetic beauty of science and math. This includes the beauty in nature (like the hyperbolic geometry in a sea slug) as well as the beauty in manmade creations (such as Islamic mosaic tiling patterns). They educate using letters, exhibitions and publications, including several exhibits featuring hyperbolic crochet work. The organization was founded by Margaret Wertheim because she was discovering so many different artistic things in science (such as hyperbolic crochet) but major science magazines weren’t interested in them because they were considered more art or craft than science. She wanted to share these project as well as make science more accessible to non-scientists. Perhaps the most well-known endeavor of the IFF is the Hyperbolic Crochet Coral Reef Project, which is described as “a woolly celebration of the intersection of higher geometry and feminine handicraft, and a testimony to the disappearing wonders of the marine world”. Basically it is a replication of The Great Barrier Reef that has been done in crochet. The reef project started out as a joking suggestion by Christine Wertheim. It was taken seriously by Margaret and ultimately became a huge and inspiring art project. The two sisters really balanced their different styles out in this project, with Margaret creating more mathematically correct structured pieces and Christine adding a more playful exploration of crochet. In fact, there have been many sub-reefs that have now been created and displayed in addition to the original Great Barrier Reef. One expansion of this project that I like is the Toxic Reef, which incorporates plarn (plastic bag yarn) into the design to raise additional awareness about the specific environmental dangers of plastic trash. Another satellite project that I’m interested in is the one created by women in Indiana State Prison. There are many prison crochet projects and I think this one, which adds the components of math and science and art together, is a great one! It is also important to note that the Wertheim sisters launched this project using the hyperbolic crochet “discovered”in 1997 by Daina Taimina. Taimina realized that using a simple algorithm when crocheting could create mathematically pure figures that could help explain the complexities of geometry in a highly visual format. The Wertheim sisters elevated this to a beautiful artistic level with their reef project. One of the ways in which they expanded upon Taimina’s work was by using different types of yarn – furry yarn, boucles, etc. – to create strikingly different effects. This is what made the pieces look alive, like sea creatures. Another way that they expanded on Taimina’s work was that they didn’t just increase the same number of stitches each round but alternated their increases to create different organic shapes. Interesting fact: Taimina originally tried to use knitting to shoe mathematical principals but it didn’t work because it quickly led to too many loops on the needle. Crochet worked! Most crochet art has two distinct components to it. First, it is visually striking. Of course, beauty is in the eye of the beholder so you and I may disagree about what makes beautiful crochet art but there’s clearly a visual component to crochet art. Second, there is typically a message or intention behind the art work. For example, many crochet artists use this craft to explore issues of womanhood, gender identity and relationships because it has traditionally been a domestic art (and not one that’s always been taken seriously as an art form). The work of Margaret and Christine Wertheim explores these themes. 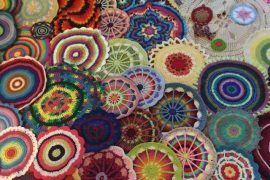 It takes the “domestic” or feminine craft of crochet and uses it to explore and explain complex mathematics, typically considered a “male” subject. Margaret Wertheim has written a book that addresses this issue: A Field Guide to Hyperbolic Space: An Exploration of the Intersection of Higher Geometry and Feminine Handicraft . She also discusses the issue in depth in an interview with Maria Elena Buszek, which was published in an interesting book called Extra/Ordinary: Craft and Contemporary Art . The Crochet Coral Reef Project is also art with a message. It is used to raise awareness of the ecological issues facing this planet, specifically how global warming and pollution are causing great devastation to the natural wonder that is The Great Barrier Reef. It’s green art. A fun related fact about this project is that several of the crochet reef objects were featured in the sets of a sock puppet play called Quoi that Christine Wertheim wrote and directed in 2008. That’s adding one layer of art to another – I love it! I think one of the coolest things about the hyperbolic crochet that has been created, used and written about by these women is the fact that you don’t have to understand math to create with it but it can be used to explain math if you’re interested in that. 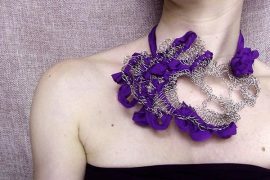 Hyperbolic crochet uses simple algorithms to create shapes. For someone who is crocheting, this can be translated to something as simple as working in the round and always working two stitches into each stitch of the previous round, thus creating a mathematically pure and visually striking piece of crochet that looks like something that could be found in nature. However, you can explore it with a mathematician’s eye to get a better sense of what may previously have just been theoretical math for you. I know that I personally didn’t do well in geometry classes at all because my brain just didn’t compute that way but working with hyperbolic crochet techniques helps make some of it just make sense in my brain. The sisters were involved in another similar art project in 2008 which explored the life of LA’s Inland Empire. Their Crochet Cactus Garden was a key feature of this project. The women curated the project, which was a collaborative project featuring the crochet work of nearly one dozen contributors. Explore the work of these great women who I would definitely call artists! What do you think? Are Margaret and Christine Wertheim crochet artists?